Who can set up the environment? Initially, only the person who has signed up for the Swivle trial has access to the tool with which the environment can be set up: the Management console. You can check this by logging in to Swivle, clicking your Avatar and checking if the option 'Management console' is present. Once additional users have been added, the role of admin can (optionally) be transferred to or shared with other users. There are a few key steps to take before you can start using Swivle with your team. Creating Rules to determine which groups can access which files within your Swivle environment. Configuring which groups can access which Metadata fields. Configuring Download Presets so your team members can work more efficiently. Configuring Branding options, to give Swivle your own styling. Setting up rules can be a complex process! You might benefit from first creating an overview (on paper or in a spreadsheet) of all users and user groups and which type of access you want to grant them. Rules can be assigned to users and groups. When a rules is applied to a group, it will take effect on users assigned to that group. For this reason, when first setting up, we recommend adding your rules to groups, so that you don't have to set up duplicate rules for your users. Applying Rules affects the time it takes to perform searches and retrieve search results. The higher the number of Rules assigned and the more complex they are, the more the search performance is affected. In the Brand portal, folders appears as 'Categories': links that can be clicked. Because the folder name is used as the name of the Category, make sure that descriptive folder names are used as much as possible. Grant or deny folder access to each user or user group as needed so that only links appear of locations that the user is allowed access to. Users with a Content Consumer subscription will work within the Brand portal, a basic version of Swivle with limited features. Users with a Content Manager subscription will have access to the Pro Client as well as the Brand Portal and all its features. Additionally, Admin users will be able to access the Management Console. Only Content Managers can be made admin. Set up Rules to control access to files, either based on a folder path, metadata they contain, or both. The Rule is assigned to a group. As part of this step, Permissions are assigned which control the actions that can be performed on the files that are defined in the Rule. Such permissions include viewing, editing or deleting the files. Access for viewing and / or editing specific metadata fields and letting users make use of Download Presets is also defined for groups in separate steps. Swivle uses an additive permission model. This means that a user has no access to content, unless a rule grants them access. It's also important to keep in mind that when a user is in two groups, permissions are merged. An example: a user is in Group "A", which allows users to access files under the folder "/MyBrand/Logos," with an additional query which says "NOT status:Final". This means that users in "A" will be able to access all files under "/MyBrand/Logos" with the exception for files that have the field "status" set to "Final". Now, when the user is added to Group "B", which allows users to access files under the folder "/MyBrand/Logos," with an additional query which says "status:Final"
This means that users in "B" will be able to access any file under "/MyBrand/Logos" that have the field "status" set to "Final", nothing else. However, our user being in both "A" and "B" will be able to see all files in "/MyBrand/Logos", regardless of the status field value. In a sense, the rule granting access will override the rule denying access. We know it's a lot to take in. But to help you get familiar with the principles mentioned above, we've set up some groups and permissions for you when you started your trial. The first time you log in to the Management Console, you will find the Managers and Consumer groups there, as well as some basic Download Presets. You can change these as much as you like, as well as create your own. 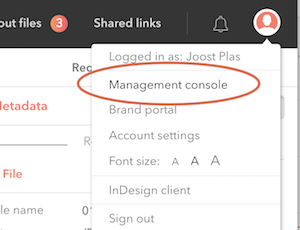 To access the Management Console, click your Avatar and choose 'Management console'. Although technically there is no strict order in the way to set up the environment, you do have to create a group before you can start setting up Rules and Download presets. By default, users can either download a preview of a file, download the original file, or they can create a custom download to download the file in a specific format, size and resolution. Note: This applies to downloading files in Swivle itself as well as downloading files that are shared. To improve efficiency, download presets containing often used download settings can be made available to user groups. This way the users do not have to go through the process of creating a custom download each time themselves. For more information how to set up download presets, see Setting up download presets in the Management Console. After setting up access rights for groups, users can be invited. Leaving this step as the last in the process makes sure that when users accept the invitation they will directly have access to the files that they should be allowed to work with. Users are added by sending them an invitation. The e-mail address of the user is treated as the user account. Users can be part of one or more groups. By adding a user to a group, they will be given access to the files by means of the Rules that have been set up for that group. The look and feel of Swivle environment can be changed to match the style of the brand for which Elvis cloud is used, for example by matching it with the branding of a company, product or publication. For more information on configuring branding, see Branding your Swivle environment. To leave the Management Console and return to Swivle, click your Avatar and choose 'Go to Swivle'.